Post-Injection Delirium/Sedation Syndrome — Adverse events with signs and symptoms consistent with olanzapine overdose, in particular, sedation (including coma) and/or delirium, have been reported following injections of ZYPREXA RELPREVV. ZYPREXA RELPREVV must be administered in a registered healthcare facility with ready access to emergency response services. After each injection, patients must be observed at the healthcare facility by a healthcare professional for at least 3 hours. Because of this risk, ZYPREXA RELPREVV is available only through a restricted distribution program called ZYPREXA RELPREVV Patient Care Program and requires prescriber, healthcare facility, patient, and pharmacy enrollment [see Dosage and Administration (2.1), Warnings and Precautions (5.1, 5.2), Overdosage (10.2), and Patient Counseling Information (17.2)]. Increased Mortality in Elderly Patients with Dementia-Related Psychosis — Elderly patients with dementia-related psychosis treated with antipsychotic drugs are at an increased risk of death. Analyses of seventeen placebo-controlled trials (modal duration of 10 weeks), largely in patients taking atypical antipsychotic drugs, revealed a risk of death in drug-treated patients of between 1.6 to 1.7 times the risk of death in placebo-treated patients. Over the course of a typical 10-week controlled trial, the rate of death in drug-treated patients was about 4.5%, compared to a rate of about 2.6% in the placebo group. Although the causes of death were varied, most of the deaths appeared to be either cardiovascular (e.g., heart failure, sudden death) or infectious (e.g., pneumonia) in nature. Observational studies suggest that, similar to atypical antipsychotic drugs, treatment with conventional antipsychotic drugs may increase mortality. The extent to which the findings of increased mortality in observational studies may be attributed to the antipsychotic drug as opposed to some characteristic(s) of the patients is not clear. ZYPREXA RELPREVV is not approved for the treatment of patients with dementia-related psychosis [see Warnings and Precautions (5.3, 5.16) and Patient Counseling Information (17.3)]. These highlights do not include all the information needed to use ZYPREXA RELPREVV safely and effectively. See full prescribing information for ZYPREXA RELPREVV. ZYPREXA RELPREVV is intended for deep intramuscular gluteal injection only. ZYPREXA RELPREVV is available only through a restricted distribution program [see Warnings and Precautions (5.2)]. ZYPREXA RELPREVV must not be dispensed directly to a patient. For a patient to receive treatment, the prescriber, healthcare facility, patient, and pharmacy must all be enrolled in the ZYPREXA RELPREVV Patient Care Program. To enroll, call 1-877-772-9390. ZYPREXA RELPREVV is indicated for the treatment of schizophrenia. Efficacy was established in two clinical trials in patients with schizophrenia: one 8-week trial in adults and one maintenance trial in adults [see Clinical Studies (14.1)]. ZYPREXA RELPREVV is intended for deep intramuscular gluteal injection only and should not be administered intravenously or subcutaneously. Be aware that there are two ZYPREXA intramuscular formulations with different dosing schedules. ZYPREXA IntraMuscular (10 mg/vial) is a short-acting formulation and should not be confused with ZYPREXA RELPREVV. Refer to the package insert for ZYPREXA IntraMuscular for more information about that product. Establish tolerability with oral olanzapine prior to initiating treatment. ZYPREXA RELPREVV should be administered by a healthcare professional every 2 to 4 weeks by deep intramuscular gluteal injection using a 19-gauge, 1.5-inch needle. Following insertion of the needle into the muscle, aspiration should be maintained for several seconds to ensure that no blood is drawn into the syringe. If any blood is aspirated into the syringe, it should be discarded and fresh drug should be prepared using a new convenience kit. The injection should be performed at a steady, continuous pressure. Do not massage the injection site. Dose Selection — The efficacy of ZYPREXA RELPREVV has been demonstrated within the range of 150 mg to 300 mg administered every 2 weeks and with 405 mg administered every 4 weeks. Dose recommendations considering oral ZYPREXA and ZYPREXA RELPREVV are shown in Table 1. ZYPREXA RELPREVV doses greater than 405 mg every 4 weeks or 300 mg every 2 weeks have not been evaluated in clinical trials. Post-Injection Delirium/Sedation Syndrome — During premarketing clinical studies, adverse events that presented with signs and symptoms consistent with olanzapine overdose, in particular, sedation (including coma) and/or delirium, were reported in patients following an injection of ZYPREXA RELPREVV [see Boxed Warning, Warnings and Precautions (5.1), and Overdosage (10.1)]. Patients should be informed of this risk and how to recognize related symptoms [see Patient Counseling Information (17.1, 17.2)]. ZYPREXA RELPREVV must be administered in a registered healthcare facility with ready access to emergency response services. After each ZYPREXA RELPREVV injection, a healthcare professional must continuously observe the patient at the healthcare facility for at least 3 hours for symptoms consistent with olanzapine overdose, including sedation (ranging from mild in severity to coma) and/or delirium (including confusion, disorientation, agitation, anxiety, and other cognitive impairment). Other symptoms noted include extrapyramidal symptoms, dysarthria, ataxia, aggression, dizziness, weakness, hypertension, and convulsion. The potential for onset of an event is greatest within the first hour. The majority of cases have occurred within the first 3 hours after injection; however, the event has occurred after 3 hours. Following the 3-hour observation period, healthcare professionals must confirm that the patient is alert, oriented, and absent of any signs and symptoms of post-injection delirium/sedation syndrome prior to being released. All patients must be accompanied to their destination upon leaving the facility. For the remainder of the day of each injection, patients should not drive or operate heavy machinery, and should be advised to be vigilant for symptoms of post-injection delirium/sedation syndrome and be able to obtain medical assistance if needed. If post-injection delirium/sedation syndrome is suspected, close medical supervision and monitoring should be instituted in a facility capable of resuscitation [see Overdosage (10)]. Dosing in Specific Populations — Tolerance of oral ZYPREXA should be established prior to initiating treatment with ZYPREXA RELPREVV. The recommended starting dose is ZYPREXA RELPREVV 150 mg/4 wks in patients who are debilitated, who have a predisposition to hypotensive reactions, who otherwise exhibit a combination of factors that may result in slower metabolism of olanzapine (e.g., nonsmoking female patients ≥65 years of age), or who may be more pharmacodynamically sensitive to olanzapine. When indicated, dose escalation should be undertaken with caution in these patients [see Warnings and Precautions (5.18), Drug Interactions (7), and Clinical Pharmacology (12.3)]. ZYPREXA RELPREVV has not been studied in subjects under 18 years of age [see Warnings and Precautions (5.7)]. Maintenance Treatment — Although no controlled studies have been conducted to determine how long patients should be treated with ZYPREXA RELPREVV, efficacy has been demonstrated over a period of 24 weeks in patients with stabilized schizophrenia. Additionally, oral ZYPREXA has been shown to be effective in maintenance of treatment response in schizophrenia in longer-term use. Patients should be periodically reassessed to determine the need for continued treatment. Switching from Other Antipsychotics — There are no systematically collected data to specifically address how to switch patients with schizophrenia from other antipsychotics to ZYPREXA RELPREVV. For deep intramuscular gluteal injection only. Not to be injected intravenously or subcutaneously. — For obese patients, a 2-inch (50 mm), 19-gauge or larger needle (not included in convenience kit) may be used for administration. ZYPREXA RELPREVV must be suspended using only the diluent supplied in the convenience kit. It is recommended that gloves are used when reconstituting, as ZYPREXA RELPREVV may be irritating to the skin. Flush with water if contact is made with skin. See additional insert entitled “Instructions to Reconstitute and Administer ZYPREXA RELPREVV” (included) for more information regarding the safe and effective use of the Hypodermic Needle-Pro syringe and needle. Refer to the table below to determine the amount of diluent to be added to powder for reconstitution of each vial strength. It is important to note that there is more diluent in the vial than is needed to reconstitute. Please read the Hypodermic Needle-Pro Instructions for Use before proceeding with Step 3. Failure to follow these instructions may result in a needlestick injury. Loosen the powder by lightly tapping the vial. Open the prepackaged Hypodermic Needle-Pro syringe and needle with needle protection device. Withdraw the pre-determined diluent volume (Step 2) into the syringe. Inject the diluent into the powder vial. Withdraw air to equalize the pressure in the vial by pulling back slightly on the plunger in the syringe. Remove the needle from the vial, holding the vial upright to prevent any loss of material. Engage the needle safety device (refer to complete Hypodermic Needle-Pro Instructions for Use). Pad a hard surface to cushion impact (see Figure 1). Tap the vial firmly and repeatedly on the surface until no powder is visible. Figure 1: Tap firmly to mix. Visually check the vial for clumps. Unsuspended powder appears as yellow, dry clumps clinging to the vial. Additional tapping may be required if large clumps remain (see Figure 2). Figure 2: Check for unsuspended powder and repeat tapping if needed. 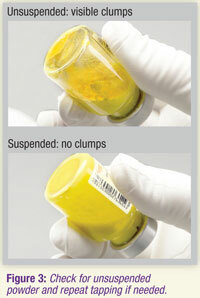 Shake the vial vigorously until the suspension appears smooth and is consistent in color and texture. The suspended product will be yellow and opaque (see Figure 3). Figure 3: Vigorously shake vial. If foam forms, let vial stand to allow foam to dissipate. If the product is not used right away, it should be shaken vigorously to re-suspend. Reconstituted ZYPREXA RELPREVV remains stable for up to 24 hours in the vial. Before administering the injection, confirm there will be someone to accompany the patient after the 3-hour observation period. If this cannot be confirmed, do not give the injection. 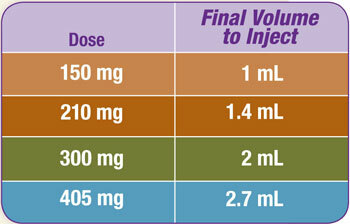 Refer to the table below to determine the final volume to inject. Suspension concentration is 150 mg/mL ZYPREXA RELPREVV. Attach a new safety needle to the syringe. Slowly withdraw the desired amount into the syringe. Some excess product will remain in the vial. Engage the needle safety device and remove needle from syringe. For administration, select the 19-gauge, 1.5-inch (38 mm) Hypodermic Needle-Pro needle with needle protection device. 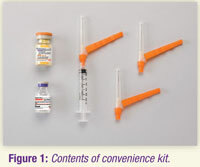 For obese patients, a 2-inch (50 mm), 19-gauge or larger needle (not included in convenience kit) may be used. To help prevent clogging, a 19-gauge or larger needle must be used. Attach the new safety needle to the syringe prior to injection. Once the suspension has been removed from the vial, it should be injected immediately. For deep intramuscular gluteal injection only. Do not inject intravenously or subcutaneously. Select and prepare a site for injection in the gluteal area. After insertion of the needle into the muscle, aspirate for several seconds to ensure that no blood appears. If any blood is drawn into the syringe, discard the syringe and the dose and begin with a new convenience kit. The injection should be performed with steady, continuous pressure. Do not massage the injection site. Engage the needle safety device. Dispose of the vials, needles, and syringe appropriately after injection. The vial is for single-use only. ZYPREXA RELPREVV is a powder for suspension for intramuscular use only. ZYPREXA RELPREVV is present as a yellow solid in a glass vial equivalent to 210, 300, or 405 mg olanzapine per vial. The diluent is a clear, colorless to slightly yellow solution in a glass vial [see Description (11) and How Supplied/Storage and Handling (16)]. The reconstituted suspension will be yellow and opaque [see Dosage and Administration (2.2)]. During premarketing clinical studies of ZYPREXA RELPREVV, adverse events that presented with signs and symptoms consistent with olanzapine overdose, in particular, sedation (including coma) and/or delirium, were reported in patients following an injection of ZYPREXA RELPREVV [see Boxed Warning and Dosage and Administration (2.1)]. These events occurred in <0.1% of injections and in approximately 2% of patients who received injections for up to 46 months. These events were correlated with an unintentional rapid increase in serum olanzapine concentrations to supra-therapeutic ranges in some cases. While a rapid and greater than expected increase in serum olanzapine concentration has been observed in some patients with these events, the exact mechanism by which the drug was unintentionally introduced into the blood stream is not known. Clinical signs and symptoms included dizziness, confusion, disorientation, slurred speech, altered gait, difficulty ambulating, weakness, agitation, extrapyramidal symptoms, hypertension, convulsion, and reduced level of consciousness ranging from mild sedation to coma. Time after injection to event ranged from soon after injection to greater than 3 hours after injection. The majority of patients were hospitalized and some required supportive care, including intubation, in several cases. All patients had largely recovered by 72 hours. The risk of an event is the same at each injection, so the risk per patient is cumulative (i.e., increases with the number of injections) [see Overdosage (10.1)]. Healthcare professionals are advised to discuss this potential risk with patients each time they prescribe and administer ZYPREXA RELPREVV [see Patient Counseling Information (17.1, 17.2)]. ZYPREXA RELPREVV is available only through a restricted distribution program [see Boxed Warning, Indications and Usage (1), and Patient Counseling Information (17.2)]. ZYPREXA RELPREVV must not be dispensed directly to a patient. For a patient to receive treatment, the prescriber, healthcare facility, patient, and pharmacy must all be enrolled in the ZYPREXA RELPREVV Patient Care Program. To enroll, call 1-877-772-9390. ZYPREXA RELPREVV must be administered in a registered healthcare facility (such as a hospital, clinic, residential treatment center, or community healthcare center) with ready access to emergency response services. After each ZYPREXA RELPREVV injection, a healthcare professional must continuously observe the patient at the healthcare facility for at least 3 hours and must confirm that the patient is alert, oriented, and absent of any signs and symptoms of post-injection delirium/sedation syndrome prior to being released. All patients must be accompanied to their destination upon leaving the facility. For the remainder of the day of each injection, patients should not drive or operate heavy machinery, and should be advised to be vigilant for symptoms of post-injection delirium/sedation syndrome and be able to obtain medical assistance if needed. If post-injection delirium/sedation syndrome is suspected, close medical supervision and monitoring should be instituted in a facility capable of resuscitation [see Overdosage (10)]. If parenteral benzodiazepines are required for patient management during an event of post-injection delirium/sedation syndrome, careful evaluation of clinical status for excessive sedation and cardiorespiratory depression is recommended. Elderly patients with dementia-related psychosis treated with antipsychotic drugs are at an increased risk of death. ZYPREXA RELPREVV is not approved for the treatment of patients with dementia-related psychosis [see Boxed Warning, Warnings and Precautions (5.16), and Patient Counseling Information (17.3)]. In placebo-controlled oral olanzapine clinical trials of elderly patients with dementia-related psychosis, the incidence of death in olanzapine-treated patients was significantly greater than placebo-treated patients (3.5% vs 1.5%, respectively). Cerebrovascular adverse events (e.g., stroke, transient ischemic attack), including fatalities, were reported in patients in trials of oral olanzapine in elderly patients with dementia-related psychosis. In placebo-controlled trials, there was a significantly higher incidence of cerebrovascular adverse events in patients treated with oral olanzapine compared to patients treated with placebo. ZYPREXA RELPREVV is not approved for the treatment of patients with dementia-related psychosis [see Boxed Warning and Patient Counseling Information (17.3)]. The possibility of a suicide attempt is inherent in schizophrenia, and close supervision of high-risk patients should accompany drug therapy. If a patient requires antipsychotic drug treatment after recovery from NMS, the potential reintroduction of drug therapy should be carefully considered and tolerability with oral olanzapine should be established prior to initiating treatment with ZYPREXA RELPREVV [see Dosage and Administration (2.1)]. The patient should be carefully monitored, since recurrences of NMS have been reported [see Patient Counseling Information (17.4)]. Drug Reaction with Eosinophilia and Systemic Symptoms (DRESS) has been reported with olanzapine exposure. DRESS may present with a cutaneous reaction (such as rash or exfoliative dermatitis), eosinophilia, fever, and/or lymphadenopathy with systemic complications such as hepatitis, nephritis, pneumonitis, myocarditis, and/or pericarditis. DRESS is sometimes fatal. Discontinue ZYPREXA RELPREVV if DRESS is suspected [see Patient Counseling Information (17.5)]. Physicians should consider the risks and benefits when prescribing olanzapine to patients with an established diagnosis of diabetes mellitus, or having borderline increased blood glucose level (fasting 100-126 mg/dL, nonfasting 140-200 mg/dL). Patients taking olanzapine should be monitored regularly for worsening of glucose control. Patients starting treatment with olanzapine should undergo fasting blood glucose testing at the beginning of treatment and periodically during treatment. Any patient treated with atypical antipsychotics should be monitored for symptoms of hyperglycemia including polydipsia, polyuria, polyphagia, and weakness. Patients who develop symptoms of hyperglycemia during treatment with atypical antipsychotics should undergo fasting blood glucose testing. In some cases, hyperglycemia has resolved when the atypical antipsychotic was discontinued; however, some patients required continuation of anti-diabetic treatment despite discontinuation of the suspect drug [see Patient Counseling Information (17.6)]. Olanzapine Monotherapy in Adults — In an analysis of 5 placebo-controlled adult olanzapine monotherapy studies with a median treatment duration of approximately 3 weeks, olanzapine was associated with a greater mean change in fasting glucose levels compared to placebo (2.76 mg/dL versus 0.17 mg/dL). The difference in mean changes between olanzapine and placebo was greater in patients with evidence of glucose dysregulation at baseline (patients diagnosed with diabetes mellitus or related adverse reactions, patients treated with anti-diabetic agents, patients with a baseline random glucose level ≥200 mg/dL, and/or a baseline fasting glucose level ≥126 mg/dL). Olanzapine-treated patients had a greater mean HbA1c increase from baseline of 0.04% (median exposure 21 days), compared to a mean HbA1c decrease of 0.06% in placebo-treated subjects (median exposure 17 days). Olanzapine Monotherapy in Adolescents — The safety and efficacy of ZYPREXA RELPREVV have not been established in patients under the age of 18 years. In an analysis of 3 placebo-controlled oral olanzapine monotherapy studies of adolescent patients (13-17 years), including those with schizophrenia (6 weeks) or bipolar I disorder (manic or mixed episodes) (3 weeks), olanzapine was associated with a greater mean change from baseline in fasting glucose levels compared to placebo (2.68 mg/dL versus -2.59 mg/dL). The mean change in fasting glucose for adolescents exposed at least 24 weeks was 3.1 mg/dL (N=121). Table 3 shows short-term and long-term changes in fasting blood glucose from adolescent oral olanzapine monotherapy studies. Undesirable alterations in lipids have been observed with olanzapine use. Clinical monitoring, including baseline and periodic follow-up lipid evaluations in patients using olanzapine, is recommended [see Patient Counseling Information (17.7)]. Dose group differences with respect to increases in fasting triglycerides have been observed. In a 24-week randomized, double-blind, fixed-dose study with ZYPREXA RELPREVV, statistically significant differences among dose groups have been observed for fasting triglycerides. Incidence of changes from normal to high levels of fasting triglycerides at any time during the trial indicated significant differences between the highest dose group (300 mg/2 weeks, 24.5% [13/53]) and the lower dose groups (150 mg/2 weeks, 6.5% [4/62]; 405 mg/4 weeks, 9.8% [13/133]). In an analysis of 3 placebo-controlled oral olanzapine monotherapy studies of adolescents (13-17 years), including those with schizophrenia (6 weeks) or bipolar I disorder (manic or mixed episodes) (3 weeks), olanzapine-treated adolescents had increases from baseline in mean fasting total cholesterol, LDL cholesterol, and triglycerides of 12.9 mg/dL, 6.5 mg/dL, and 28.4 mg/dL, respectively, compared to increases from baseline in mean fasting total cholesterol and LDL cholesterol of 1.3 mg/dL and 1.0 mg/dL, and a decrease in triglycerides of 1.1 mg/dL for placebo-treated adolescents. For fasting HDL cholesterol, no clinically meaningful differences were observed between olanzapine-treated adolescents and placebo-treated adolescents. Potential consequences of weight gain should be considered prior to starting olanzapine. Patients receiving olanzapine should receive regular monitoring of weight [see Patient Counseling Information (17.8)]. Dose group differences with respect to weight gain have been observed in some studies. In a 24-week randomized, double-blind, fixed-dose study with ZYPREXA RELPREVV, mean baseline-to-endpoint increase in weight (150 mg/2 weeks, n=140: 0.67 kg; 405 mg/4 weeks, n=315: 0.89 kg; 300 mg/2 weeks, n=140: 1.70 kg) was observed with significant differences between the lowest and highest dose groups (150 vs 300 mg/2 weeks). In a single 8-week randomized, double-blind, fixed-dose study comparing 10 (N=199), 20 (N=200) and 40 (N=200) mg/day of oral olanzapine in adult patients with schizophrenia or schizoaffective disorder, mean baseline to endpoint increase in weight (10 mg/day: 1.9 kg; 20 mg/day: 2.3 kg; 40 mg/day: 3 kg) was observed with significant differences between 10 vs 40 mg/day. Mean increase in weight in adolescents was greater than in adults. In 4 placebo-controlled trials, discontinuation due to weight gain occurred in 1% of olanzapine-treated patients, compared to 0% of placebo-treated patients. ZYPREXA RELPREVV may induce orthostatic hypotension associated with dizziness, tachycardia, bradycardia and, in some patients, syncope, probably reflecting its α1-adrenergic antagonistic properties [see Patient Counseling Information (17.9)]. Syncope-related adverse reactions were reported in 0.1% of patients treated with ZYPREXA RELPREVV in clinical studies. From an analysis of the vital sign data in an integrated database of 41 completed clinical studies in adult patients treated with oral olanzapine, orthostatic hypotension was recorded in ≥20% (1277/6030) of patients. Olanzapine should be used with particular caution in patients with known cardiovascular disease (history of myocardial infarction or ischemia, heart failure, or conduction abnormalities), cerebrovascular disease, and conditions which would predispose patients to hypotension (dehydration, hypovolemia, and treatment with antihypertensive medications) where the occurrence of syncope, or hypotension and/or bradycardia might put the patient at increased medical risk. For patients in this population who have never taken oral olanzapine, tolerability should be established with oral olanzapine prior to initiating treatment with ZYPREXA RELPREVV [see Dosage and Administration (2.1)]. ZYPREXA RELPREVV may cause somnolence, postural hypotension, motor and sensory instability, which may lead to falls and, consequently, fractures or other injuries. For patients with diseases, conditions, or medications that could exacerbate these effects, complete fall risk assessments when initiating antipsychotic treatment and recurrently for patients on long-term antipsychotic therapy. Possible risk factors for leukopenia/neutropenia include pre-existing low white blood cell count (WBC) and history of drug-induced leukopenia/neutropenia. Patients with a history of a clinically significant low WBC or drug induced leukopenia/neutropenia should have their complete blood count (CBC) monitored frequently during the first few months of therapy and discontinuation of ZYPREXA RELPREVV should be considered at the first sign of a clinically significant decline in WBC in the absence of other causative factors. Patients with clinically significant neutropenia should be carefully monitored for fever or other symptoms or signs of infection and treated promptly if such symptoms or signs occur. Patients with severe neutropenia (absolute neutrophil count <1000/mm3) should discontinue ZYPREXA RELPREVV and have their WBC followed until recovery. During premarketing testing of ZYPREXA RELPREVV, seizures occurred in 0.15% of patients. During premarketing testing of oral olanzapine, seizures occurred in 0.9% of olanzapine-treated patients. There were confounding factors that may have contributed to the occurrence of seizures in many of these cases. Olanzapine should be used cautiously in patients with a history of seizures or with conditions that potentially lower the seizure threshold, e.g., Alzheimer's dementia. Olanzapine is not approved for the treatment of patients with Alzheimer's disease. Conditions that lower the seizure threshold may be more prevalent in a population of 65 years or older. Sedation was a commonly reported adverse reaction associated with ZYPREXA RELPREVV treatment, occurring at an incidence of 8% in ZYPREXA RELPREVV patients compared to 2% in placebo patients. Somnolence and sedation adverse reactions led to discontinuation in 0.6% of patients in the premarketing ZYPREXA RELPREVV database. Since olanzapine has the potential to impair judgment, thinking, or motor skills, patients should be cautioned about operating hazardous machinery, including automobiles, until they are reasonably certain that olanzapine therapy does not affect them adversely. However, due to the risk of post-injection delirium/sedation syndrome after each injection, patients should not drive or operate heavy machinery for the remainder of the day of each injection [see Dosage and Administration (2.1), Warnings and Precautions (5.1), and Patient Counseling Information (17.10)]. Disruption of the body's ability to reduce core body temperature has been attributed to antipsychotic agents. Appropriate care is advised when prescribing ZYPREXA RELPREVV for patients who will be experiencing conditions which may contribute to an elevation in core body temperature, e.g., exercising strenuously, exposure to extreme heat, receiving concomitant medication with anticholinergic activity, or being subject to dehydration [see Patient Counseling Information (17.11)]. Experience with ZYPREXA RELPREVV in patients with concomitant systemic illnesses is limited [see Clinical Pharmacology (12.3)]. Olanzapine exhibits in vitro muscarinic receptor affinity. In premarketing clinical trials with oral olanzapine, olanzapine was associated with constipation, dry mouth, and tachycardia, all adverse reactions possibly related to cholinergic antagonism. Such adverse reactions were not often the basis for discontinuations from olanzapine, but olanzapine should be used with caution in patients with clinically significant prostatic hypertrophy, narrow angle glaucoma, or a history of paralytic ileus or related conditions. In 5 placebo-controlled studies of oral olanzapine in elderly patients with dementia-related psychosis (n=1184), the following treatment-emergent adverse reactions were reported in olanzapine-treated patients at an incidence of at least 2% and significantly greater than placebo-treated patients: falls, somnolence, peripheral edema, abnormal gait, urinary incontinence, lethargy, increased weight, asthenia, pyrexia, pneumonia, dry mouth and visual hallucinations. The rate of discontinuation due to adverse reactions was significantly greater with oral olanzapine than placebo (13% vs 7%). Elderly patients with dementia-related psychosis treated with olanzapine are at an increased risk of death compared to placebo. Olanzapine is not approved for the treatment of patients with dementia-related psychosis [see Boxed Warning, Warnings and Precautions (5.3), and Patient Counseling Information (17.3)]. Olanzapine has not been evaluated or used to any appreciable extent in patients with a recent history of myocardial infarction or unstable heart disease. Patients with these diagnoses were excluded from premarketing clinical studies. Because of the risk of orthostatic hypotension with olanzapine, caution should be observed in cardiac patients [see Warnings and Precautions (5.9)]. Tissue culture experiments indicate that approximately one-third of human breast cancers are prolactin dependent in vitro, a factor of potential importance if the prescription of these drugs is contemplated in a patient with previously detected breast cancer. As is common with compounds which increase prolactin release, an increase in mammary gland neoplasia was observed in the oral olanzapine carcinogenicity studies conducted in mice and rats [see Nonclinical Toxicology (13.1)]. Neither clinical studies nor epidemiologic studies conducted to date have shown an association between chronic administration of this class of drugs and tumorigenesis in humans; the available evidence is considered too limited to be conclusive at this time. Dose group differences with respect to prolactin elevation have been observed in some studies. In a 24-week randomized, double-blind, fixed-dose study with ZYPREXA RELPREVV, statistically significant differences among dose groups were observed for prolactin levels, with a mean baseline-to-endpoint increase observed in the highest dose group (300 mg/2 weeks, n=115: 3.57 ng/mL) relative to mean decreases in the lower dose groups (150 mg/2 weeks, n=109: -5.61 ng/mL; 405 mg/4 weeks, n=259: -2.76 ng/mL). In a single 8-week randomized, double-blind, fixed-dose study comparing 10 (N=199), 20 (N=200) and 40 (N=200) mg/day of oral olanzapine in adult patients with schizophrenia or schizoaffective disorder, incidence of prolactin elevation >24.2 ng/mL (female) or >18.77 ng/mL (male) at any time during the trial (10 mg/day: 31.2%; 20 mg/day: 42.7%; 40 mg/day: 61.1%) indicated significant differences between 10 vs 40 mg/day and 20 vs 40 mg/day. Fasting blood glucose testing and lipid profile at the beginning of, and periodically during, treatment is recommended [see Warnings and Precautions (5.7) and Patient Counseling Information (17.6, 17.7)]. The information below for ZYPREXA RELPREVV is derived primarily from a clinical trial database consisting of 2058 patients with approximately 1948 patient years of exposure to ZYPREXA RELPREVV. This database includes safety data from 6 open-label studies and 2 double-blind comparator studies, conducted in patients with schizophrenia or schizoaffective disorder. Additionally, data obtained from patients treated with oral olanzapine are also presented below. Adverse reactions were assessed by the collection of adverse reactions, vital signs, weights, laboratory analytes, ECGs, and the results of physical and ophthalmologic examinations. In the tables and tabulations that follow for ZYPREXA RELPREVV, the MedDRA terminology has been used to classify reported adverse reactions. Data obtained from oral olanzapine studies was reported using the COSTART and MedDRA dictionaries. The stated frequencies of adverse reactions represent the proportion of individuals who experienced, at least once, a treatment-emergent adverse reaction of the type listed. A reaction was considered treatment emergent if it occurred for the first time or worsened while receiving therapy following baseline evaluation. Reactions listed elsewhere in labeling may not be repeated below. The entire label should be read to gain a complete understanding of the safety profile of ZYPREXA RELPREVV. The prescriber should be aware that the figures in the tables and tabulations cannot be used to predict the incidence of side effects in the course of usual medical practice where patient characteristics and other factors differ from those that prevailed in the clinical trials. Similarly, the cited frequencies cannot be compared with figures obtained from other clinical investigations involving different treatments, uses, and investigators. The cited figures, however, do provide the prescribing physician with some basis for estimating the relative contribution of drug and nondrug factors to the adverse reaction incidence in the population studied. Overall, there was no difference in the incidence of discontinuation due to adverse reactions between ZYPREXA RELPREVV (4%; 13/306 patients) and placebo (5%; 5/98 patients) in an 8-week trial. In an 8-week trial, treatment-emergent adverse reactions with an incidence of 5% or greater in at least one of the ZYPREXA RELPREVV treatment groups (210 mg/2 weeks, 405 mg/4 weeks, or 300 mg/2 weeks) and greater than placebo were: headache, sedation, weight gain, cough, diarrhea, back pain, nausea, somnolence, dry mouth, nasopharyngitis, increased appetite, and vomiting. Table 9 enumerates the incidence, rounded to the nearest percent, of treatment-emergent adverse reactions that occurred in 2% or more of patients treated with ZYPREXA RELPREVV and with incidence greater than placebo who participated in the 8-week, placebo-controlled trial. a The term abdominal pain upper was combined under abdominal pain. b The term tooth abscess was combined under tooth infection. c The terms alanine aminotransferase increased, aspartate aminotransferase increased, and gamma-glutamyltransferase increased were combined under hepatic enzyme increased. d The term tension headache was combined under headache. e The term somnolence was combined under sedation. f The term sinus congestion was combined under nasal congestion. Dose group differences have been observed for weight, fasting triglycerides and prolactin elevation for ZYPREXA RELPREVV [see Warnings and Precautions (5.7, 5.17)]. A dose group difference for oral olanzapine has been observed for fatigue, dizziness, weight gain and prolactin elevation. In a single 8-week randomized, double-blind, fixed-dose study comparing 10 (N=199), 20 (N=200) and 40 (N=200) mg/day of oral olanzapine in adult patients with schizophrenia or schizoaffective disorder, incidence of fatigue (10 mg/day: 1.5%; 20 mg/day: 2.1%; 40 mg/day: 6.6%) was observed with significant differences between 10 vs 40 and 20 vs 40 mg/day. The incidence of dizziness (10 mg/day: 2.6%; 20 mg/day: 1.6%; 40 mg/day: 6.6%) was observed with significant differences between 20 vs 40 mg. Dose group differences were also noted for weight gain and prolactin elevation [see Warnings and Precautions (5.7, 5.17)]. b Percentage of patients with a Barnes Akathisia Scale global score ≥2. Eleven ZYPREXA RELPREVV-treated patients (3.6%) and 0 placebo-treated patients experienced treatment-emergent injection-related adverse reactions (injection site pain, buttock pain, injection site mass, induration, injection site induration) in the placebo-controlled database. The most frequently occurring treatment-emergent adverse reaction was injection site pain (2.3% ZYPREXA RELPREVV-treated; 0% placebo-treated). Injection site abscess has been reported in clinical trials with ZYPREXA RELPREVV therapy. Isolated cases required surgical intervention. In clinical trials of oral olanzapine monotherapy for the treatment of schizophrenia in adult patients, treatment-emergent adverse reactions with an incidence of 5% or greater in the olanzapine treatment arm and at least twice that of placebo were: postural hypotension, constipation, weight gain, dizziness, personality disorder, and akathisia. Following is a list of treatment-emergent adverse reactions reported by patients treated with oral olanzapine (at multiple doses ≥1 mg/day) in clinical trials. This listing is not intended to include reactions (1) already listed in previous tables or elsewhere in labeling, (2) for which a drug cause was remote, (3) which were so general as to be uninformative, (4) which were not considered to have significant clinical implications, or (5) which occurred at a rate equal to or less than placebo. Reactions are classified by body system using the following definitions: frequent adverse reactions are those occurring in at least 1/100 patients; infrequent adverse reactions are those occurring in 1/100 to 1/1000 patients; rare adverse reactions are those occurring in fewer than 1/1000 patients. Body as a Whole — Infrequent: chills, face edema, photosensitivity reaction, suicide attempt1; Rare: chills and fever, hangover effect, sudden death1. Cardiovascular System — Infrequent: cerebrovascular accident, vasodilatation. Digestive System — Infrequent: abdominal distension, nausea and vomiting, tongue edema; Rare: ileus, intestinal obstruction, liver fatty deposit. Hemic and Lymphatic System — Infrequent: thrombocytopenia. Metabolic and Nutritional Disorders — Frequent: alkaline phosphatase increased; Infrequent: bilirubinemia, hypoproteinemia. Musculoskeletal System — Rare: osteoporosis. Nervous System — Infrequent: ataxia, dysarthria, libido decreased, stupor; Rare: coma. Respiratory System — Infrequent: epistaxis; Rare: lung edema. Skin and Appendages — Infrequent: alopecia. Special Senses — Infrequent: abnormality of accommodation, dry eyes; Rare: mydriasis. Urogenital System — Infrequent: amenorrhea2, breast pain, decreased menstruation, impotence2, increased menstruation2, menorrhagia2, metrorrhagia2, polyuria2, urinary frequency, urinary retention, urinary urgency, urination impaired. ZYPREXA RELPREVV in Adults: Statistically significant within group mean changes for ZYPREXA RELPREVV, which were also significantly different from placebo, were observed for the following: eosinophils, monocytes, cholesterol, low-density lipoprotein (LDL), triglycerides, and direct bilirubin. There were no statistically significant differences between ZYPREXA RELPREVV and placebo in the incidence of potentially clinically significant changes in any of the laboratory values studied. Statistically significant within group mean changes for ZYPREXA RELPREVV, which were also significantly different from oral olanzapine (in a 24-week double-blind study), were observed for the following: gamma-glutamyltransferase (GGT) and sodium. From an analysis of the laboratory data in an integrated database of 41 completed clinical studies in adult patients treated with oral olanzapine, high GGT levels were recorded in ≥1% (88/5245) of patients. Statistically significant differences were observed between ZYPREXA RELPREVV and oral olanzapine for the incidence of treatment-emergent low platelet count (0% ZYPREXA RELPREVV vs 1% oral olanzapine); and low total bilirubin (2.8% ZYPREXA RELPREVV vs 0.7% for oral olanzapine). There was a statistically significant difference between ZYPREXA RELPREVV and oral olanzapine in potentially clinically significant changes for high leukocyte count (0% ZYPREXA RELPREVV vs 1% oral olanzapine). Changes in aminotransferases observed with ZYPREXA RELPREVV treatment were similar to those reported with ZYPREXA treatment. In placebo-controlled ZYPREXA RELPREVV studies, clinically significant ALT elevations (≥3 times the upper limit of the normal range) were observed in 2.7% (8/291) of patients exposed to olanzapine compared to 3.2% (3/94) of the placebo patients. None of these patients experienced jaundice. In 3 of these patients, liver enzymes reverted to the normal range despite continued treatment, and in 5 cases enzymes values decreased, but were still above the normal range at the end of therapy. Within the larger premarketing ZYPREXA RELPREVV database of 1886 patients with baseline ALT ≤90 IU/L, the incidence of ALT elevation to >200 IU/L was 0.8%. None of these patients experienced jaundice or other symptoms attributable to liver impairment and most had transient changes that tended to normalize while ZYPREXA RELPREVV treatment was continued. From an analysis of the laboratory data in an integrated database of 41 completed clinical studies in adult patients treated with oral olanzapine, elevated uric acid was recorded in ≥3% (171/4641) of patients. Olanzapine Monotherapy in Adults: An assessment of the premarketing experience for oral olanzapine revealed an association with asymptomatic increases in ALT, AST, and GGT. Within the original premarketing database of about 2400 adult patients with baseline ALT ≤90 IU/L, the incidence of ALT elevations to >200 IU/L was 2% (50/2381). None of these patients experienced jaundice or other symptoms attributable to liver impairment and most had transient changes that tended to normalize while olanzapine treatment was continued. In placebo-controlled oral olanzapine monotherapy studies in adults, clinically significant ALT elevations (change from <3 times the upper limit of normal [ULN] at baseline to ≥3 times ULN) were observed in 5% (77/1426) of patients exposed to olanzapine compared to 1% (10/1187) of patients exposed to placebo. ALT elevations ≥5 times ULN were observed in 2% (29/1438) of olanzapine-treated patients, compared to 0.3% (4/1196) of placebo-treated patients. ALT values returned to normal, or were decreasing, at last follow-up in the majority of patients who either continued treatment with olanzapine or discontinued olanzapine. No patient with elevated ALT values experienced jaundice, liver failure, or met the criteria for Hy's Rule. Oral olanzapine administration was also associated with increases in serum prolactin [see Warnings and Precautions (5.17)], with an asymptomatic elevation of the eosinophil count in 0.3% of patients, and with an increase in CPK. ECG Changes — Comparison of ZYPREXA RELPREVV and oral olanzapine, in a 24 week study, revealed no significant differences on ECG changes. Between-group comparisons for pooled placebo-controlled trials revealed no significant oral olanzapine/placebo differences in the proportions of patients experiencing potentially important changes in ECG parameters, including QT, QTc, and PR intervals. Oral olanzapine use was associated with a mean increase in heart rate of 2.4 beats per minute compared to no change among placebo patients. This slight tendency to tachycardia may be related to olanzapine's potential for inducing orthostatic changes [see Warnings and Precautions (5.11)]. Adverse reactions reported since market introduction that were temporally (but not necessarily causally) related to ZYPREXA therapy include the following: allergic reaction (e.g., anaphylactoid reaction, angioedema, pruritus or urticaria), cholestatic or mixed liver injury, diabetic coma, diabetic ketoacidosis, discontinuation reaction (diaphoresis, nausea, or vomiting), Drug Reaction with Eosinophilia and Systemic Symptoms (DRESS), hepatitis, jaundice, neutropenia, pancreatitis, priapism, rash, restless legs syndrome, rhabdomyolysis, stuttering1, and venous thromboembolic events (including pulmonary embolism and deep venous thrombosis). Random cholesterol levels of ≥240 mg/dL and random triglyceride levels of ≥1000 mg/dL have been reported. Additionally, injection site abscess has been reported in postmarketing reports with ZYPREXA RELPREVV therapy. Isolated cases required surgical intervention. Diazepam — The co-administration of diazepam with olanzapine potentiated the orthostatic hypotension observed with olanzapine [see Drug Interactions (7.2)]. Inducers of CYP1A2 — Carbamazepine therapy (200 mg bid) causes an approximately 50% increase in the clearance of olanzapine. This increase is likely due to the fact that carbamazepine is a potent inducer of CYP1A2 activity. Higher daily doses of carbamazepine may cause an even greater increase in olanzapine clearance. Alcohol — Ethanol (45 mg/70 kg single dose) did not have an effect on olanzapine pharmacokinetics. The co-administration of alcohol (i.e., ethanol) with olanzapine potentiated the orthostatic hypotension observed with olanzapine [see Drug Interactions (7.2)]. Inhibitors of CYP1A2 — Fluvoxamine, a CYP1A2 inhibitor, decreases the clearance of olanzapine. This results in a mean increase in olanzapine Cmax following fluvoxamine of 54% in female nonsmokers and 77% in male smokers. The mean increase in olanzapine AUC is 52% and 108%, respectively. Lower doses of olanzapine should be considered in patients receiving concomitant treatment with fluvoxamine. Inhibitors of CYP2D6 — Fluoxetine caused a small decrease in olanzapine clearance leading to a minimal change in olanzapine steady-state concentrations and, therefore dose modification is not routinely recommended. Warfarin — Warfarin (20 mg single dose) did not affect olanzapine pharmacokinetics [see Drug Interactions (7.2)]. Inducers of CYP1A2 or Glucuronyl Transferase Enzymes — Omeprazole and rifampin may cause an increase in olanzapine clearance. CNS Acting Drugs — Given the primary CNS effects of olanzapine, caution should be used when olanzapine is taken in combination with other centrally acting drugs and alcohol. Antihypertensive Agents — Olanzapine, because of its potential for inducing hypotension, may enhance the effects of certain antihypertensive agents. Levodopa and Dopamine Agonists — Olanzapine may antagonize the effects of levodopa and dopamine agonists. Lorazepam (IM) — Co-administration of lorazepam does not significantly affect the pharmacokinetics of olanzapine, unconjugated lorazepam, or total lorazepam. However, this co-administration of lorazepam with olanzapine potentiated the somnolence observed with either drug alone. Valproate — Olanzapine (10 mg daily for 2 weeks) did not affect the steady-state plasma concentrations of valproate. Therefore, concomitant olanzapine administration does not require dosage adjustment of valproate. Effect of Olanzapine on Drug Metabolizing Enzymes — In vitro studies utilizing human liver microsomes suggest that olanzapine has little potential to inhibit CYP1A2, CYP2C9, CYP2C19, CYP2D6, and CYP3A. Thus, olanzapine is unlikely to cause clinically important drug interactions mediated by these enzymes. Imipramine — Single doses of olanzapine did not affect the pharmacokinetics of imipramine or its active metabolite desipramine. Warfarin — Single doses of olanzapine did not affect the pharmacokinetics of warfarin [see Drug Interactions (7.1)]. Diazepam — Olanzapine did not influence the pharmacokinetics of diazepam or its active metabolite N-desmethyldiazepam. However, diazepam co-administered with olanzapine increased the orthostatic hypotension observed with either drug given alone [see Drug Interactions (7.1)]. Alcohol — Multiple doses of olanzapine did not influence the kinetics of ethanol [see Drug Interactions (7.1)]. Biperiden — Multiple doses of olanzapine did not influence the kinetics of biperiden. Teratogenic Effects, Pregnancy Category C — In oral reproduction studies in rats at doses up to 18 mg/kg/day and in rabbits at doses up to 30 mg/kg/day (9 and 30 times the maximum recommended human daily oral dose on a mg/m2 basis, respectively) no evidence of teratogenicity was observed. In an oral rat teratology study, early resorptions and increased numbers of nonviable fetuses were observed at a dose of 18 mg/kg/day (9 times the maximum recommended human daily oral dose on a mg/m2 basis). Gestation was prolonged at 10 mg/kg/day (5 times the maximum recommended human daily oral dose on a mg/m2 basis). In an oral rabbit teratology study, fetal toxicity (manifested as increased resorptions and decreased fetal weight) occurred at a maternally toxic dose of 30 mg/kg/day (30 times the maximum recommended human daily oral dose on a mg/m2 basis). No evidence of teratogenicity or embryo-fetal toxicity was observed in rats or rabbits with ZYPREXA RELPREVV at intramuscular doses up to 75 mg/kg (1 and 2 times the maximum recommended human dose of 300 mg every 2 weeks, respectively, on a mg/m2 basis). Placental transfer of olanzapine occurred in rat pups. There are no adequate and well-controlled trials with olanzapine in pregnant females. Four pregnancies were observed during clinical trials with ZYPREXA RELPREVV, including 1 resulting in a normal birth and 3 therapeutic abortions. Because animal reproduction studies are not always predictive of human response, this drug should be used during pregnancy only if the potential benefit justifies the potential risk to the fetus. Nonteratogenic Effects — Neonates exposed to antipsychotic drugs (including olanzapine), during the third trimester of pregnancy are at risk for extrapyramidal and/or withdrawal symptoms following delivery. There have been reports of agitation, hypertonia, hypotonia, tremor, somnolence, respiratory distress and feeding disorder in these neonates. These complications have varied in severity; while in some cases symptoms have been self-limited, in other cases neonates have required intensive care unit support and prolonged hospitalization. ZYPREXA RELPREVV should be used during pregnancy only if the potential benefit justifies the potential risk to the fetus. In an oral olanzapine study in lactating, healthy women, olanzapine was excreted in breast milk. Mean infant dose at steady state was estimated to be 1.8% of the maternal olanzapine dose. It is recommended that women receiving ZYPREXA RELPREVV should not breast-feed. Safety and effectiveness of ZYPREXA RELPREVV in children and adolescent patients have not been established [see Warnings and Precautions (5.7)]. Compared to patients from adult clinical trials, adolescents treated with oral ZYPREXA were likely to gain more weight, experience increased sedation, and have greater increases in total cholesterol, triglycerides, LDL cholesterol, prolactin and hepatic aminotransferase levels. Clinical studies of ZYPREXA RELPREVV did not include sufficient numbers of subjects aged 65 and over to determine whether they respond differently from younger subjects. In the premarketing clinical studies with oral olanzapine, there was no indication of any different tolerability of olanzapine in elderly patients compared to younger patients with schizophrenia. Oral olanzapine studies in elderly patients with dementia-related psychosis have suggested that there may be a different tolerability profile in this population compared to younger patients with schizophrenia. Elderly patients with dementia-related psychosis treated with olanzapine are at an increased risk of death compared to placebo. In placebo-controlled studies of olanzapine in elderly patients with dementia-related psychosis, there was a higher incidence of cerebrovascular adverse events (e.g., stroke, transient ischemic attack) in patients treated with olanzapine compared to patients treated with placebo. Olanzapine is not approved for the treatment of patients with dementia-related psychosis. Also, the presence of factors that might decrease pharmacokinetic clearance or increase the pharmacodynamic response to olanzapine should lead to consideration of a lower starting dose for any geriatric patient [see Boxed Warning, Dosage and Administration (2.1), and Warnings and Precautions (5.3)]. Olanzapine has not been systematically studied in humans for its potential for abuse, tolerance, or physical dependence. Because ZYPREXA RELPREVV is to be administered by healthcare professionals, the potential for misuse or abuse by patients is low. During premarketing clinical studies of ZYPREXA RELPREVV, adverse reactions that presented with signs and symptoms consistent with olanzapine overdose, in particular, sedation (including coma) and/or delirium, were reported in patients following an injection of ZYPREXA RELPREVV [see Boxed Warning and Dosage and Administration (2.1)]. These reactions occurred in <0.1% of injections and in approximately 2% of patients who received injections for up to 46 months. These reactions were correlated with an unintentional rapid increase in serum olanzapine concentrations to supra-therapeutic ranges in some cases. While a rapid and greater than expected increase in serum olanzapine concentration has been observed in some patients with these reactions, the exact mechanism by which the drug was unintentionally introduced into the blood stream is not known. Clinical signs and symptoms included dizziness, confusion, disorientation, slurred speech, altered gait, difficulty ambulating, weakness, agitation, extrapyramidal symptoms, hypertension, convulsion, and reduced level of consciousness ranging from mild sedation to coma. Time after injection to event ranged from soon after injection to greater than 3 hours after injection. The majority of patients were hospitalized and some required supportive care, including intubation, in several cases. All patients had largely recovered by 72 hours. The risk of an event is the same at each injection, so the risk per patient is cumulative (i.e., increases with the number of injections) [see Warnings and Precautions (5.1)]. In postmarketing reports of overdose with oral olanzapine alone, symptoms have been reported in the majority of cases. In symptomatic patients, symptoms with ≥10% incidence included agitation/aggressiveness, dysarthria, tachycardia, various extrapyramidal symptoms, and reduced level of consciousness ranging from sedation to coma. Among less commonly reported symptoms were the following potentially medically serious reactions: aspiration, cardiopulmonary arrest, cardiac arrhythmias (such as supraventricular tachycardia and 1 patient experiencing sinus pause with spontaneous resumption of normal rhythm), delirium, possible neuroleptic malignant syndrome, respiratory depression/arrest, convulsion, hypertension, and hypotension. Eli Lilly and Company has received reports of fatality in association with overdose of oral olanzapine alone. In 1 case of death, the amount of acutely ingested oral olanzapine was reported to be possibly as low as 450 mg of oral olanzapine; however, in another case, a patient was reported to survive an acute olanzapine ingestion of approximately 2 g of oral olanzapine. Post-injection delirium/sedation syndrome may occur with each injection of ZYPREXA RELPREVV. Signs and symptoms consistent with olanzapine overdose have been observed, and access to emergency response services must be readily available for safe use [see Boxed Warning and Warnings and Precautions (5.1)]. There is no specific antidote to olanzapine. Therefore, appropriate supportive measures should be initiated. Hypotension and circulatory collapse should be treated with appropriate measures such as intravenous fluids and/or sympathomimetic agents. (Do not use epinephrine, dopamine, or other sympathomimetics with beta-agonist activity, since beta stimulation may worsen hypotension in the setting of olanzapine-induced alpha blockade.) Respiratory support, including ventilation, may be required. Close medical supervision and monitoring should continue until the patient recovers. The possibility of multiple drug involvement should be considered. In case of acute overdosage, establish and maintain an airway and ensure adequate oxygenation and ventilation, which may include intubation. The possibility of obtundation, seizures, or dystonic reaction of the head and neck following overdose may create a risk of aspiration with induced emesis. Cardiovascular monitoring should commence immediately and should include continuous electrocardiographic monitoring to detect possible arrhythmias. ZYPREXA RELPREVV is a long-acting form of olanzapine and is intended for deep intramuscular gluteal injection only. ZYPREXA RELPREVV includes a vial of the drug product and a vial of the sterile diluent for ZYPREXA RELPREVV. The drug product is olanzapine pamoate monohydrate, present as a yellow solid in a glass vial equivalent to 210, 300, or 405 mg olanzapine base per vial. The diluent for ZYPREXA RELPREVV is a clear, colorless to slightly yellow solution in a glass vial and is composed of carboxymethylcellulose sodium, mannitol, polysorbate 80, sodium hydroxide and/or hydrochloric acid for pH adjustment, and water for injection. The drug product is suspended in the diluent for ZYPREXA RELPREVV to a target concentration of 150 mg olanzapine per mL prior to intramuscular injection. The mechanism of action of olanzapine, as with other drugs having efficacy in schizophrenia, is unknown. However, it has been proposed that this drug's efficacy in schizophrenia is mediated through a combination of dopamine and serotonin type 2 (5HT2) antagonism. Olanzapine binds with high affinity to the following receptors: serotonin 5HT2A/2C, 5HT6 (Ki=4, 11, and 5 nM, respectively), dopamine D1-4 (Ki=11-31 nM), histamine H1 (Ki=7 nM), and adrenergic α1 receptors (Ki=19 nM). 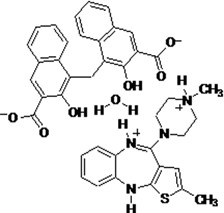 Olanzapine is an antagonist with moderate affinity binding for serotonin 5HT3 (Ki=57 nM) and muscarinic M1-5 (Ki=73, 96, 132, 32, and 48 nM, respectively). Olanzapine binds weakly to GABAA, BZD, and β-adrenergic receptors (Ki>10 μM). Antagonism at receptors other than dopamine and 5HT2 may explain some of the other therapeutic and side effects of olanzapine. Olanzapine's antagonism of muscarinic M1-5 receptors may explain its anticholinergic-like effects. Olanzapine's antagonism of histamine H1 receptors may explain the somnolence observed with this drug. Olanzapine's antagonism of adrenergic α1 receptors may explain the orthostatic hypotension observed with this drug. The fundamental pharmacokinetic properties of olanzapine are similar for ZYPREXA RELPREVV and orally administered olanzapine. Refer to the section below describing the pharmacokinetics of orally administered olanzapine for details. Slow dissolution of ZYPREXA RELPREVV, a practically insoluble salt, after a deep intramuscular gluteal injection of a dose of ZYPREXA RELPREVV results in prolonged systemic olanzapine plasma concentrations that are sustained over a period of weeks to months. An injection every 2 or 4 weeks provides olanzapine plasma concentrations that are similar to those achieved by daily doses of oral olanzapine. The steady-state plasma concentrations for ZYPREXA RELPREVV for doses of 150 mg to 405 mg every 2 or 4 weeks are within the range of steady-state olanzapine plasma concentration known to have been associated with oral doses of 5 mg to 20 mg olanzapine once daily. The change to a slow release, rate-controlled absorption process is the only fundamental pharmacokinetic difference between the administration of ZYPREXA RELPREVV and orally administered olanzapine. The effective half-life for olanzapine after intramuscular ZYPREXA RELPREVV administration is approximately 30 days as compared to a half-life after oral administration of approximately 30 hours. Exposure to olanzapine may persist for a period of months after a ZYPREXA RELPREVV injection. The long persistence of systemic concentrations of olanzapine may be an important consideration for the long-term clinical management of the patient. Typical systemic olanzapine plasma concentrations reach a peak within the first week after injection and are at trough level immediately prior to the next injection. The olanzapine plasma concentration fluctuation between the peak and trough is comparable to the peak and trough fluctuations associated with once daily oral dosing. Dose Proportionality and Oral Dose Correspondence — ZYPREXA RELPREVV provides a dose of 150, 210, 300, or 405 mg olanzapine. An injection of a larger dose produces a dose-proportional increase in the systemic exposure. The olanzapine exposure after doses of ZYPREXA RELPREVV corresponds to exposure for oral doses of olanzapine. A ZYPREXA RELPREVV dose of 300 mg olanzapine injected every two weeks delivers approximately 20 mg olanzapine per day and a ZYPREXA RELPREVV dose of 150 mg olanzapine injected every two weeks delivers approximately 10 mg per day. These ZYPREXA RELPREVV doses sustain steady-state olanzapine concentrations over long periods of treatment. Pharmacokinetic Impact of Switching to ZYPREXA RELPREVV from Oral Olanzapine — The switch from oral olanzapine to ZYPREXA RELPREVV changes the pharmacokinetics from an elimination-rate-controlled to an absorption-rate-controlled process. The switch to ZYPREXA RELPREVV may require treatment for a period of approximately 3 months to re-establish steady-state conditions. Initial treatment with ZYPREXA RELPREVV is recommended at a dose corresponding to the mg/day oral dose [see Dosage and Administration (2.1)]. Plasma concentrations of olanzapine during the first injection interval may be lower than those maintained by a corresponding oral dose. Even though the concentrations are lower, the olanzapine concentrations remained within a therapeutically effective range and supplementation with orally administered olanzapine was generally not necessary in clinical trials. Olanzapine is extensively distributed throughout the body, with a volume of distribution of approximately 1000 L. It is 93% bound to plasma proteins over the concentration range of 7 to 1100 ng/mL, binding primarily to albumin and α1-acid glycoprotein. Metabolism and Elimination — Following a single oral dose of 14C labeled olanzapine, 7% of the dose of olanzapine was recovered in the urine as unchanged drug, indicating that olanzapine is highly metabolized. Approximately 57% and 30% of the dose was recovered in the urine and feces, respectively. In the plasma, olanzapine accounted for only 12% of the AUC for total radioactivity, indicating significant exposure to metabolites. After multiple dosing, the major circulating metabolites were the 10-N-glucuronide, present at steady state at 44% of the concentration of olanzapine, and 4′-N-desmethyl olanzapine, present at steady state at 31% of the concentration of olanzapine. Both metabolites lack pharmacological activity at the concentrations observed. Intramuscular Formulations — There are two formulations of ZYPREXA which are available for intramuscular injection. One form (ZYPREXA RELPREVV) is described in this package insert. The other formulation (ZYPREXA IntraMuscular) is a solution of olanzapine. When ZYPREXA IntraMuscular is injected intramuscularly, olanzapine (as the free base) is rapidly absorbed and peak plasma concentrations occur within 15 to 45 minutes. With the exception of higher maximum plasma concentrations, the pharmacokinetics of olanzapine after ZYPREXA IntraMuscular are similar to those for orally administered olanzapine. Refer to the package insert for ZYPREXA IntraMuscular for additional information. Specific Populations — In general, the decision to use ZYPREXA RELPREVV in specific populations should be thoughtfully considered. For patients who have never taken oral olanzapine, tolerability should be established with oral olanzapine prior to initiating treatment with ZYPREXA RELPREVV. The recommended starting dose is ZYPREXA RELPREVV 150 mg/4 wks, in patients who are debilitated, who have a predisposition to hypotensive reactions, who otherwise exhibit a combination of factors that may result in slower metabolism of olanzapine (e.g., nonsmoking female patients >65 years of age), or who may be more pharmacodynamically sensitive to olanzapine. When indicated, dose escalation should be performed with caution in these patients [see Dosage and Administration (2.1)]. Precautions noted below need to be carefully weighed. Renal Impairment — Because olanzapine is highly metabolized before excretion and only 7% of the drug is excreted unchanged, renal dysfunction alone is unlikely to have a major impact on the pharmacokinetics of olanzapine. The pharmacokinetic characteristics of orally administered olanzapine were similar in patients with severe renal impairment and normal subjects, indicating that dosage adjustment based upon the degree of renal impairment is not required. In addition, olanzapine is not removed by dialysis. The effect of renal impairment on metabolite elimination has not been studied. Hepatic Impairment — Although the presence of hepatic impairment may be expected to reduce the clearance of olanzapine, a study of the effect of impaired liver function in subjects (n=6) with clinically significant (Childs Pugh Classification A and B) cirrhosis revealed little effect on the pharmacokinetics of orally administered olanzapine. Geriatric — In a study involving 24 healthy subjects, the mean elimination half-life of orally administered olanzapine was about 1.5 times greater in elderly (≥65 years) than in nonelderly subjects (<65 years). Caution should be used in dosing the elderly, especially if there are other factors that might additively influence drug metabolism and/or pharmacodynamic sensitivity [see Dosage and Administration (2.1)]. Gender — For both oral ZYPREXA and ZYPREXA RELPREVV higher average plasma concentrations of olanzapine were observed in women than in men. There were, however, no apparent differences between men and women in effectiveness or adverse effects. Dosage modifications based on gender should not be needed. Smoking Status — For both oral ZYPREXA and ZYPREXA RELPREVV, studies have demonstrated that the clearance of olanzapine is higher in smokers than in nonsmokers, although dosage modifications are not routinely recommended. Race — In vivo studies of orally administered olanzapine have shown that exposures are similar among Japanese, Chinese and Caucasians, especially after normalization for body weight differences. Dosage modifications for race are, therefore, not recommended. Combined Effects — The combined effects of age, smoking, and gender could lead to substantial pharmacokinetic differences in populations. The clearance in young smoking males, for example, may be 3 times higher than that in elderly nonsmoking females. Dosing modification may be necessary in patients who exhibit a combination of factors that may result in slower metabolism of olanzapine [see Dosage and Administration (2.1)]. Carcinogenesis — Oral carcinogenicity studies were conducted in mice and rats. Olanzapine was administered to mice in two 78-week studies at doses of 3, 10, 30/20 mg/kg/day (equivalent to 0.8-5 times the maximum recommended human daily oral dose on a mg/m2 basis) and 0.25, 2, 8 mg/kg/day (equivalent to 0.06-2 times the maximum recommended human daily oral dose on a mg/m2 basis). Rats were dosed for 2 years at doses of 0.25, 1, 2.5, 4 mg/kg/day (males) and 0.25, 1, 4, 8 mg/kg/day (females) (equivalent to 0.13-2 and 0.13-4 times the maximum recommended human daily oral dose on a mg/m2 basis, respectively). The incidence of liver hemangiomas and hemangiosarcomas was significantly increased in 1 mouse study in female mice dosed at 8 mg/kg/day (2 times the maximum recommended human daily oral dose on a mg/m2 basis). These tumors were not increased in another mouse study in females dosed at 10 or 30/20 mg/kg/day (2-5 times the maximum recommended human daily oral dose on a mg/m2 basis); in this study, there was a high incidence of early mortalities in males of the 30/20 mg/kg/day group. The incidence of mammary gland adenomas and adenocarcinomas was significantly increased in female mice dosed at ≥2 mg/kg/day and in female rats dosed at ≥4 mg/kg/day (0.5 and 2 times the maximum recommended human daily oral dose on a mg/m2 basis, respectively). Rats were also treated intramuscularly with ZYPREXA RELPREVV once a month for 2 years at doses of 5, 10, 20 mg/kg (males) and 10, 25, 50 mg/kg (females) (equivalent to 0.08-0.8 times the maximum recommended human dose of 300 mg every 2 weeks on a mg/m2 basis; dosing was limited due to local reactions at the IM injection site). The incidence of tumors in this study was not altered when compared to solution for ZYPREXA RELPREVV control or pamoic acid treated animals. Antipsychotic drugs have been shown to chronically elevate prolactin levels in rodents. Serum prolactin levels were not measured during the olanzapine carcinogenicity studies; however, measurements during subchronic toxicity studies showed that olanzapine elevated serum prolactin levels up to 4-fold in rats at the same doses used in the carcinogenicity study. An increase in mammary gland neoplasms has been found in rodents after chronic administration of other antipsychotic drugs and is considered to be prolactin mediated. The relevance for human risk of the finding of prolactin mediated endocrine tumors in rodents is unknown [see Warnings and Precautions (5.17)]. Mutagenesis — No evidence of genotoxic potential for olanzapine was found in the Ames reverse mutation test, in vivo micronucleus test in mice, the chromosomal aberration test in Chinese hamster ovary cells, unscheduled DNA synthesis test in rat hepatocytes, induction of forward mutation test in mouse lymphoma cells, or in vivo sister chromatid exchange test in bone marrow of Chinese hamsters. The short-term effectiveness of ZYPREXA RELPREVV was established in an 8-week, placebo-controlled trial in adult patients (n=404) who were experiencing psychotic symptoms and met DSM-IV or DSM-IV-TR criteria for schizophrenia. Patients were randomized to receive injections of ZYPREXA RELPREVV 210 mg every 2 weeks, ZYPREXA RELPREVV 405 mg every 4 weeks, ZYPREXA RELPREVV 300 mg every 2 weeks, or placebo every 2 weeks. Patients were discontinued from their previous antipsychotics and underwent a 2-7 day washout period. No oral antipsychotic supplementation was allowed throughout the trial. The primary efficacy measure was change from baseline to endpoint in total Positive and Negative Syndrome Scale (PANSS) score (mean baseline total PANSS score 101). Total PANSS scores showed statistically significant improvement from baseline to endpoint with each dose of ZYPREXA RELPREVV (210 mg every 2 weeks, 405 mg every 4 weeks, and 300 mg every 2 weeks) as compared to placebo. The effectiveness of ZYPREXA RELPREVV in the treatment of schizophrenia is further supported by the established effectiveness of the oral formulation of olanzapine. A longer-term trial enrolled patients with schizophrenia (n=1065) who had remained stable for 4 to 8 weeks on open-label treatment with oral olanzapine (mean baseline total PANSS score 56) and were then randomized to continue their current oral olanzapine dose (10, 15, or 20 mg/day); or to ZYPREXA RELPREVV 150 mg every 2 weeks (405 mg every 4 weeks, 300 mg every 2 weeks, or 45 mg every 4 weeks). No oral antipsychotic supplementation was allowed throughout the trial. The primary efficacy measure was time to exacerbation of symptoms of schizophrenia defined in terms of increases in Brief Psychiatric Rating Scale (BPRS) positive symptoms or hospitalization. ZYPREXA RELPREVV doses of 150 mg every 2 weeks, 405 mg every 4 weeks, and 300 mg every 2 weeks were each statistically significantly superior to low dose ZYPREXA RELPREVV (45 mg every 4 weeks). ZYPREXA RELPREVV convenience kit is supplied in single-use cartons. Each carton includes one vial of olanzapine pamoate monohydrate in dosage strengths that are equivalent to 210 mg olanzapine (483 mg olanzapine pamoate monohydrate), 300 mg olanzapine (690 mg olanzapine pamoate monohydrate), and 405 mg olanzapine (931 mg olanzapine pamoate monohydrate) per vial; one vial of approximately 3 mL of diluent for ZYPREXA RELPREVV used to suspend the drug product; one 3-mL syringe with pre-attached 19-gauge, 1.5-inch (38 mm) Hypodermic Needle-Pro needle with needle protection device; and two 19-gauge, 1.5-inch (38 mm) Hypodermic Needle-Pro needles with needle protection device. Needle-Pro® is a registered trademark of Smiths Medical. ZYPREXA RELPREVV should be stored at room temperature not to exceed 30°C (86°F). When the drug product is suspended in the solution for ZYPREXA RELPREVV, it may be held at room temperature for 24 hours. The vial should be agitated immediately prior to product withdrawal. Once the suspension is withdrawn into the syringe, it should be used immediately [see Dosage and Administration (2.2)]. Patients should be advised of the following issues and asked to alert their prescriber if these occur while taking ZYPREXA RELPREVV. Patients should be advised to call their doctor if they do not think they are getting better or have concerns about their condition. Prescribers or other health professionals should inform patients, their families, and their caregivers about the potential benefits and potential risks associated with treatment with ZYPREXA RELPREVV, and should counsel them in its appropriate use. A patient Medication Guide is available for ZYPREXA RELPREVV. Prescribers or other health professionals should instruct patients, their families, and their caregivers to read the Medication Guide and should assist them in understanding its contents. Patients should be given the opportunity to discuss the contents of the Medication Guide and to obtain answers to any questions they may have. During premarketing clinical studies, reactions that presented with signs and symptoms consistent with olanzapine overdose have been reported in patients following an injection of ZYPREXA RELPREVV. It is mandatory that patients be enrolled in the ZYPREXA RELPREVV Patient Care Program to receive ZYPREXA RELPREVV treatment. Patients should be advised of the risk of post-injection delirium/sedation syndrome each time they receive an injection [see Warnings and Precautions (5.1, 5.2)]. Patient and caregivers should be advised that after each ZYPREXA RELPREVV injection, patients must be observed at the healthcare facility for at least 3 hours and must be accompanied to their destination upon leaving the facility. The Medication Guide should be distributed each time patients receive an injection. ZYPREXA RELPREVV is not approved for elderly patients with dementia-related psychosis [see Boxed Warning and Warnings and Precautions (5.3)]. Patients and caregivers should be counseled that a potentially fatal symptom complex sometimes referred to as NMS has been reported in association with administration of antipsychotic drugs, including ZYPREXA. Signs and symptoms of NMS include hyperpyrexia, muscle rigidity, altered mental status, and evidence of autonomic instability (irregular pulse or blood pressure, tachycardia, diaphoresis, and cardiac dysrhythmia) [see Warnings and Precautions (5.5)]. Patients should be advised to report to their health care provider at the earliest onset of any signs or symptoms that may be associated with Drug Reaction with Eosinophilia and Systemic Symptoms (DRESS) [see Warnings and Precautions (5.6)]. Patients should be advised of the potential risk of hyperglycemia-related adverse reactions related to ZYPREXA RELPREVV. Patients should be monitored regularly for worsening of glucose control. Patients who have diabetes should follow their doctor's instructions about how often to check their blood sugar while taking ZYPREXA RELPREVV [see Warnings and Precautions (5.7)]. Patients should be counseled that dyslipidemia has occurred during treatment with ZYPREXA RELPREVV. Patients should have their lipid profile monitored regularly [see Warnings and Precautions (5.7)]. Patients should be counseled that weight gain has occurred during treatment with ZYPREXA RELPREVV. Patients should have their weight monitored regularly [see Warnings and Precautions (5.7)]. Patients should be advised of the risk of orthostatic hypotension, and in association with the use of concomitant drugs that may potentiate the orthostatic effect of ZYPREXA RELPREVV, e.g., diazepam or alcohol [see Warnings and Precautions (5.9) and Drug Interactions (7)]. Patients should be advised to change positions carefully to help prevent orthostatic hypotension, and to lie down if they feel dizzy or faint, until they feel better. Patients should be advised to call their doctor if they experience any of the following signs and symptoms associated with orthostatic hypotension: dizziness, fast or slow heartbeat, or fainting. Because ZYPREXA RELPREVV has the potential to impair judgment, thinking, or motor skills, patients should be cautioned about operating hazardous machinery, including automobiles, until they are reasonably certain that ZYPREXA RELPREVV therapy does not affect them adversely. Additionally, due to the risk of post-injection delirium/sedation syndrome, patients should not drive or operate heavy machinery for the remainder of the day of each injection [see Dosage and Administration (2.1) and Warnings and Precautions (5.1, 5.14)]. Patients should be advised regarding appropriate care in avoiding overheating and dehydration. Patients should be advised to call their doctor right away if they become severely ill and have some or all of these symptoms of dehydration: sweating too much or not at all, dry mouth, feeling very hot, feeling thirsty, not able to produce urine [see Warnings and Precautions (5.15)]. Patients should be advised to inform their physicians if they are taking, or plan to take, ZYPREXA or Symbyax® (olanzapine/fluoxetine combination). Patients should also be advised to inform their physicians if they are taking, plan to take, or have stopped taking any prescription or over-the-counter drugs, including herbal supplements, since there is a potential for interactions [see Drug Interactions (7)]. Patients should be advised to avoid alcohol while taking ZYPREXA RELPREVV [see Drug Interactions (7.1)]. Pregnancy — Patients should be advised to notify their physician if they become pregnant or intend to become pregnant during therapy with ZYPREXA RELPREVV [see Use in Specific Populations (8.1)]. Nursing Mothers — Patients should be advised not to breast-feed an infant if they are taking ZYPREXA RELPREVV [see Use in Specific Populations (8.3)]. Pediatric Use — Safety and effectiveness of ZYPREXA RELPREVV in patients under 18 years have not been established [see Use in Specific Populations (8.4)]. Copyright © 2009, 2018, Eli Lilly and Company. All rights reserved. Read the Medication Guide that comes with ZYPREXA RELPREVV before you start taking it and each time before you get an injection. There may be new information. This Medication Guide does not take the place of talking to your doctor about your medical condition or treatment. Talk with your doctor if there is something you do not understand or you want to learn more about ZYPREXA RELPREVV. What is the most important information I should know about ZYPREXA RELPREVV? understand the risks and benefits of ZYPREXA RELPREVV treatment. Your doctor will talk to you about the risks and benefits of ZYPREXA RELPREVV treatment. register in the ZYPREXA RELPREVV Patient Care Program. You must agree to the rules of the ZYPREXA RELPREVV Patient Care Program before you register. Post-injection Delirium Sedation Syndrome (PDSS). You will need to stay at the clinic where you receive the injection for at least 3 hours so your doctor can make sure you do not have symptoms of PDSS. When you leave the clinic someone must be with you. If you have symptoms of PDSS after you leave the clinic, get medical help or go to an emergency room right away. Increased risk of death in elderly people who are confused, have memory loss and have lost touch with reality (dementia-related psychosis). ZYPREXA RELPREVV is not approved for treating psychosis in elderly people with dementia. Your doctor should do tests to check your blood sugar before you start taking ZYPREXA RELPREVV and during treatment. In people who do not have diabetes, sometimes high blood sugar goes away when ZYPREXA RELPREVV is stopped. People with diabetes and some people who did not have diabetes before taking ZYPREXA RELPREVV need to take medicine for high blood sugar even after they stop taking ZYPREXA RELPREVV. If you have diabetes, follow your doctor's instructions about how often to check your blood sugar while taking ZYPREXA RELPREVV. High fat levels in your blood (cholesterol and triglycerides). High fat levels may happen in people treated with ZYPREXA RELPREVV, especially in teenagers (13 to 17 years old). ZYPREXA RELPREVV is not approved in patients less than 18 years old. You may not have any symptoms, so your doctor should do blood tests to check your cholesterol and triglyceride levels before you start taking ZYPREXA RELPREVV and during treatment. Weight gain. Weight gain is very common in people who take ZYPREXA RELPREVV. Teenagers (13 to 17 years old) are more likely to gain weight and to gain more weight than adults. ZYPREXA RELPREVV is not approved in patients less than 18 years old. Some people may gain a lot of weight while taking ZYPREXA RELPREVV, so you and your doctor should check your weight regularly. Talk to your doctor about ways to control weight gain, such as eating a healthy, balanced diet, and exercising. Some of your symptoms of schizophrenia may improve with treatment with ZYPREXA RELPREVV. If you do not think you are getting better, call your doctor. It is not known if ZYPREXA RELPREVV is safe and effective in children under 18 years of age. What should I tell my doctor before taking ZYPREXA RELPREVV? are pregnant or plan to become pregnant. It is not known if ZYPREXA RELPREVV will harm your unborn baby. are breast-feeding or plan to breast-feed. ZYPREXA RELPREVV can pass into your breast milk and may harm your baby. You should not breast-feed while taking ZYPREXA RELPREVV. Talk to your doctor about the best way to feed your baby if you take ZYPREXA RELPREVV. Tell your doctor about all the medicines that you take, including prescription and nonprescription medicines, vitamins, and herbal supplements. ZYPREXA RELPREVV and some medicines may interact with each other and may not work as well, or cause possible serious side effects. Your doctor can tell you if it is safe to take ZYPREXA RELPREVV with your other medicines. Do not start or stop any medicine while taking ZYPREXA RELPREVV without talking to your doctor first. How should I receive ZYPREXA RELPREVV? ZYPREXA RELPREVV will be injected into the muscle in your buttock (gluteus) by your doctor or nurse at the clinic. After receiving ZYPREXA RELPREVV, you will need to stay at the clinic for at least 3 hours. When you leave the clinic, someone must be with you. Call your doctor if you do not think you are getting better or have any concerns about your condition while taking ZYPREXA RELPREVV. What should I avoid while receiving ZYPREXA RELPREVV? ZYPREXA RELPREVV can cause sleepiness and may affect your ability to make decisions, think clearly, or react quickly. Do not drive, operate heavy machinery, or do other dangerous activities until you know how ZYPREXA RELPREVV affects you. You should not drive or operate heavy machinery for the rest of the day after each injection. Avoid drinking alcohol while taking ZYPREXA RELPREVV. Drinking alcohol while you take ZYPREXA RELPREVV may make you sleepier than if you take ZYPREXA RELPREVV alone. What are the possible side effects of ZYPREXA RELPREVV? See “What is the most important information I should know about ZYPREXA RELPREVV?”, which describes the risk of post-injection delirium sedation syndrome (PDSS), increased risk of death in elderly people with dementia-related psychosis and the risks of high blood sugar, high cholesterol and triglyceride levels, and weight gain. Increased incidence of stroke or “mini-strokes” called transient ischemic attacks (TIAs) in elderly people with dementia-related psychosis (elderly people who have lost touch with reality due to confusion and memory loss). ZYPREXA RELPREVV is not approved for these patients. Drug Reaction with Eosinophilia and Systemic Symptoms (DRESS): DRESS can occur with ZYPREXA RELPREVV. Features of DRESS may include rash, fever, swollen glands and other internal organ involvement such as liver, kidney, lung and heart. DRESS is sometimes fatal; therefore, tell your doctor immediately if you experience any of these signs. Common side effects of ZYPREXA RELPREVV include: headache, sleepiness or drowsiness, weight gain, dry mouth, diarrhea, nausea, common cold, eating more (increased appetite), vomiting, cough, back pain, or pain at the injection site. This Medication Guide summarizes the most important information about ZYPREXA RELPREVV. If you would like more information, talk with your doctor. You can ask your doctor or pharmacist for information about ZYPREXA RELPREVV that was written for healthcare professionals. 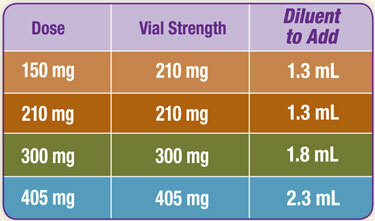 For more information about ZYPREXA RELPREVV call 1-800-Lilly-Rx (1-800-545-5979) or visit www.zyprexarelprevv.com. What are the ingredients in ZYPREXA RELPREVV? FOR DEEP INTRAMUSCULAR GLUTEAL INJECTION ONLY. NOT TO BE INJECTED INTRAVENOUSLY OR SUBCUTANEOUSLY. Refer to the table at right to determine the amount of diluent to be added to powder for reconstitution of each vial strength. 3.1 Loosen the powder by lightly tapping the vial. 3.2 Open the prepackaged Hypodermic Needle-Pro syringe and needle with needle protection device. 3.3 Withdraw the pre-determined diluent volume (Step 2) into the syringe. 3.4 Inject the diluent into the powder vial. 3.5 Withdraw air to equalize the pressure in the vial by pulling back slightly on the plunger in the syringe. 3.6 Remove the needle from the vial, holding the vial upright to prevent any loss of material. 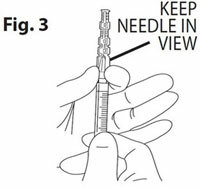 3.7 Engage the needle safety device (refer to complete Hypodermic Needle-Pro Instructions for Use). 3.8 Pad a hard surface to cushion impact (see Figure 2). Tap the vial firmly and repeatedly on the surface until no powder is visible. 3.9 Visually check the vial for clumps. Unsuspended powder appears as yellow, dry clumps clinging to the vial. Additional tapping may be required if large clumps remain (see Figure 3). 3.10 Shake the vial vigorously until the suspension appears smooth and is consistent in color and texture. The suspended product will be yellow and opaque (see Figure 4). Refer to the table at right to determine the final volume to inject. Suspension concentration is 150 mg/mL Zyprexa Relprevv. 4.1 Attach a new safety needle to the syringe. 4.2 Slowly withdraw the desired amount into the syringe. 4.3 Engage the needle safety device and remove needle from syringe. 4.4 For administration, select the 19-gauge, 1.5-inch (38 mm) Hypodermic Needle-Pro needle with needle protection device. For obese patients, a 2-inch (50 mm), 19-gauge or larger needle (not included in convenience kit) may be used. To help prevent clogging, a 19-gauge or larger needle must be used. 4.5 Attach the new safety needle to the syringe prior to injection. Once the suspension has been removed from the vial, it should be injected immediately. DO NOT INJECT INTRAVENOUSLY OR SUBCUTANEOUSLY. 4.6 Select and prepare a site for injection in the gluteal area. 4.8 Engage the needle safety device. 4.9 Dispose of the vials, needles, and syringe appropriately after injection. The vial is for single-use only. The Jelco® Hypodermic Needle-Pro® device is a sterile, single use device. It includes a needle and needle safety sheath. The Needle-Pro® device can be used with a Luer slip or Luer lock syringe. This device is intended for injection or aspiration of fluids. The needle protection device covers the needle after use to help prevent needle sticks. 4.1 A needle stick with a contaminated needle may cause infectious diseases. 4.2 Intentional disengagement of the Needle-Pro® device may result in a needle stick with a contaminated needle. 4.3 Bent or damaged needles can result in breakage or damage to the tissue or accidental needle puncture. If the needle is bent or damaged, no attempt should be made to straighten the needle or engage the Needle-Pro® device. The Needle-Pro® device may not properly contain a bent needle and/or the needle could puncture the needle protection device which may result in a needle stick with a contaminated needle. 4.4 Mishandling of the needle protection device may cause needles, especially short or small gauge needles, to bend whereby they protrude from the needle protector sheath which may result in a contaminated needle stick. 4.5 Do not use with Paraldehyde. 5.1 Do Not Reuse: Medical devices require specific material characteristics to perform as intended. These characteristics have been verified for single use only. Any attempt to re-process the device for subsequent re-use may adversely affect the integrity of the device or lead to deterioration in performance. 5.2 Follow standard infection control procedures as specified by the Centers for Disease Control and Prevention (USA) or local equivalent. 6.1 Peel blister pouch and remove device. 6.2 Attach a syringe (if not already attached) to the Luer connection of the Needle-Pro® device with an easy twisting motion. Seat the needle firmly on the Needle-Pro® device with a push and a clockwise twist, then pull the needle cap straight away from the needle. 6.3 After procedure is completed, press the needle into the sheath using a one-handed technique. Perform a one-handed technique by gently pressing the sheath against a flat surface. As The Sheath Is Pressed (Fig. 1), The Needle Is Firmly Engaged Into The Sheath (Fig. 2). 6.4 Visually confirm that the needle is fully engaged into the needle protection sheath. 6.6 After use, place sharps in a suitable sharps container. Dispose of contaminated product in a safe manner according to Centers for Disease Control and Prevention, USA and Federal/State/Local regulations (EPA, OSHA) and health care facility guidelines or local equivalent. NOTE: Additional dead space added by Needle-Pro® device averages 0.036ml. The Smiths Medical and Jelco design marks; Needle-Pro; and the color orange applied to the needle protection device are trademarks of Smiths Medical. The symbol ® indicates the trademark is registered in the U.S. Patent and Trademark Office and certain other countries. © 2013 Smiths Medical. All rights reserved. Zyprexa® Relprevv™ is a registered trademark of Eli Lilly and Company. Copyright © 2009, 2014, Eli Lilly and Company. All rights reserved. Hypodermic Needle-Pro is a registered trademark of Smiths Medical. Reconstitute each vial with 1.3 mL of enclosed diluent. The resultant solution will contain 150 mg/mL. Reconstitute each vial with 1.8 mL of enclosed diluent. The resultant solution will contain 150 mg/mL. Reconstitute each vial with 2.3 mL of enclosed diluent. The resultant solution will contain 150 mg/mL.